Hi Everyone! This is probably the last post of this year and in this occasion I want to share with you all a side project that I’ve being working on my spare time with my father. In less than 10 days we manage to build a small robot which runs all its logic inside the Drools Rule Engine. This first step main goal was to prove that it is possible to build a low cost robot which will be entirely controlled by the rule engine and the CEP features provided by Drools Fusion. We didn’t include any process execution in this first stage, but it is definitely on the roadmap. This post briefly explains what we have now working and what’s planned for the future, because this is just the beginning. The interesting side of the project is to make the robot completely autonomous, which means that it will run entirely on its own and without the need to be connected to a computer or to a power outlet in the wall. It needs to react in near real time and process information without requiring long periods of time. We are doing the tests with 100 millisecond (because that’s more than enough in this stage) lapses now but the performance can be improved to support lower latency. My father (Jose Salatino), “the electronic geek” help me with all the hardware side of the robot. I’ve started looking at the Lego NXT and WEDO platforms to see if we can reuse some of the cool things that they have designed, but the NXT runs with J2ME and it’s old at this point. I’m looking forward to see if they release something new soon. The Lego WEDO and Power Functions looks promising, but they have several limitations such as: reduced number of devices that you can handle via the USB port and there are some expensive pieces that you need to get if you want to make it work. When my father started playing with Arduino we find a lot of advantages which help us to get everything working in almost no time. In the other hand the Lego Motor & Sensors provide us a great and scalable environment to create advanced prototypes. For that reason, we choose to use Arduino as a central Hub to control a set of Sensor, Motors and Actuators, no matter if they are Lego or not. From the Hardware perspective there are a lot of things to do. We will start researching about the I2C protocol to replace all the serial communications. We know that I2C is the way to go, but we didn’t had time yet to do all the necessary tests. We currently have a hardware/physical limitation about the number of devices that we can set up. We want to push the platform limits so we will be looking forward to add more motors and more sensors to increase the robot complexity and see how far we can go. From the software perspective we have a bunch of things to solve, but this section gives a quick overview about what has been done until now. 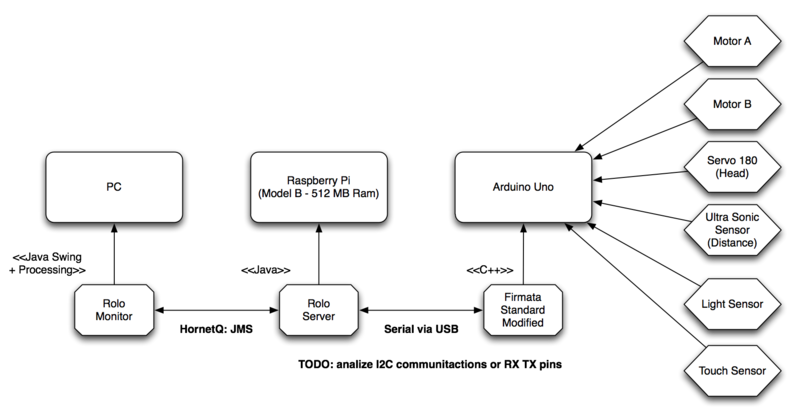 We need to understand that the Raspberry Pi is not a PC, it’s an ARM machine, which is a completely different infrastructure. For Java that’s not supposed to be a problem, but it is. When you want to access the serial port or use the USB port to transmit data, you will start facing common issues about native libraries which are not compiled for the ARM platform. Once we manage to solve those issues we need to find a way to interact with the Arduino Board which is programmed in C/C++. Luckily for us there is software called Firmata which externalise via the Serial port the whole board. Using this software we can read and write digital/analog information from the board pins. 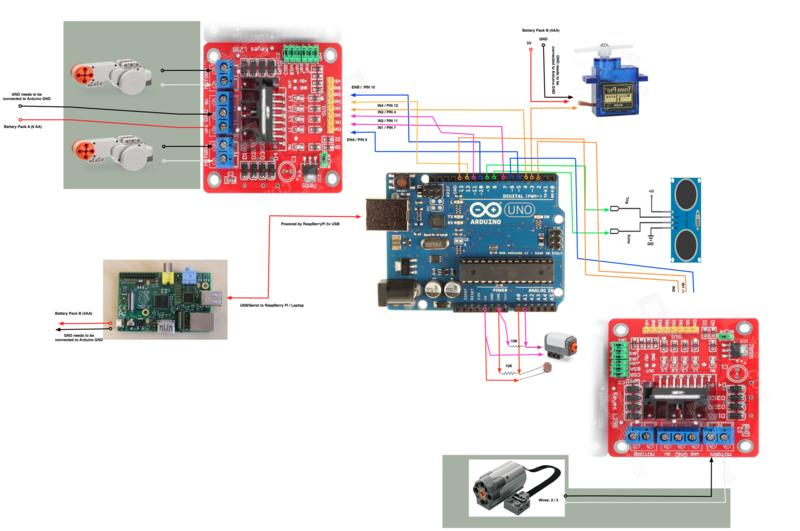 This helps us a lot, because we will write a standard software inside the Arduino which will allow us to write/read all the information that we need into the board to control the motors and read the sensors. Unfortunately, as every standard we hit a non covered sensor (SR04 – UltraSonic Sensor), and for that reason we provided a slightly modified version of the Firmata Sketch, which can be found inside the project source repository. From the Java Perspective, there is a library called processing (Processing is an open source programming language and environment for people who want to create images, animations, and interactions) which has a number of sub libraries, one of them for interacting with Firmata. I borrowed two classes from Processing in order to customize to my particular needs. From the beginning I wanted to use Processing because believe that it has a lot of potential to be mixed with the Process and Rules Engine, but this initial stage is not taking advantage of it. This rule checks the average of the distance received from a Distance Sensor (in this case the UltraSonic Sensor) in the case that the distance is less than 30cm in the last 300ms all the motors will be started at a fixed speed to move away from that object. This allows us to be sure that there is something in front of the robot instead of reacting in the first measure that matches the condition. Different functions can be used to correct wrong reads from the sensors and to improve the overall performance. Notice that after starting the motor we are registering an ActivationUnMatchListener, this will cause that as soon as the Rule doesn’t match anymore the motor will be stopped. You will see in the video, that the robot will go backward until the average received from the Distance Sensor in the last 300ms is over 30 cm. One doubt, who is controlling the wireless communication between the PC and Rolo? Hi Cristiano, the Wireless Communication is only for monitoring and testing the robot. The robot is autonomous by itself. Can you please elaborate the question a little bit more, so I can see if I understand it correctly? Previous Previous post: jBPM5 Developer Guide published!